A look at the risk in holding or buying stock in John Deere. Having recently disappointed the market with its guidance, investors will be wondering if Deere's (NYSE:DE) fortunes have now hit a trough and are about to turn up, or whether the stock has further to fall? The purpose of this article is to look at the three downside risks, so investors can make an informed decision as to whether they want to buy, hold, or sell the stock. This article is part of an ongoing series on the company, intended to give readers a balanced viewpoint. Fools have already read a summary of Deere's recent earnings linked here. Essentially, full-year expectations for net income and equipment sales were reduced in the earnings report, as the Deere's agricultural machinery sales are taking a hit from weak crop prices. There is a summary of the five key takeaways from the conference call linked here, and a look at potential upside drivers linked here. On a positive note Deere's management is being proactive in taking measures to deal with declining machinery sales. For example, two of the takeaways discussed in the conference call article linked above are measures to scale back production in order to adjust to declining sales and the launch of a certified pre-owned program. While these moves are fine and worthy, they will not reduce Deere's dependence on crop prices. If they continue to fall, Deere's prospects will get bleaker. Unfortunately, the company, and the United States Department of Agriculture, or USDA, have been reducing estimates for key crop prices. Here is how Deere recently reduced its own forecasts for key crop prices. Clearly, Deere is facing a difficult environment in 2015; with corn and wheat prices looking set to drop significantly, its agriculture & turf machinery sales (already forecast to be down 10% in 2014) could come under even more pressure going forward. The second reason to worry about Deere is that its margins and profitability are likely to take a substantial hit if sales keep falling. The following chart demonstrates the relationship and shows how wildly its margin can oscillate with movements in revenue. 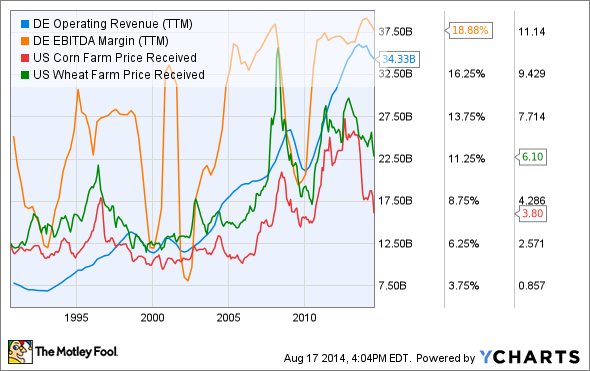 DE Operating Revenue (TTM) data by YCharts. It's one thing for analysts to have earnings numbers penciled in for 2015, but if crop prices continue to weaken, earnings guidance will have to be reduced. In other words, however cheap the stock looks now, it could start to look expensive if margin and earnings collapse. ...many of our small mid AG and C&F products will be transitioning to final Tier 4. In 2015 when higher material cost and higher spending your transition should be expected and we will not fully recover the material cost increases of the pricing in year one especially for these products. Essentially, Deere has been able to pass on the increased cost of the new emissions standards so far, partly because its end markets were good, but it will be a tougher challenge in 2015. ...the spread between used prices and their original new prices has widened from the tightest ever spreads of 2008 and 2009. Specifically, Deere prices are holding up as well or better than the competition. It could be a problem if the market weakens, because the spread is then likely to fall, and with a lot of used inventory around, Deere will face pricing pressure for its new equipment. All told, Deere is facing a deteriorating environment with falling crop prices likely to challenge is margins in future. Moreover, a weak end market would put pressure on the current spread between prices of used and new equipment sales -- with a decline in the latter hurting Deere. It puts into question Deere's hopes of achieving a 1% price increase in the fourth quarter; leading to a 2% price increase for the full-year. In addition, the transition to Tier 4 emissions standards will pressure margins in 2015. Deere faces downside risk.